Bonnie Anderson, well-known artist and owner of Potters Addict Ceramic Art Centre, studied at the University of Calgary where she triple majored in painting, printmaking, and ceramics. 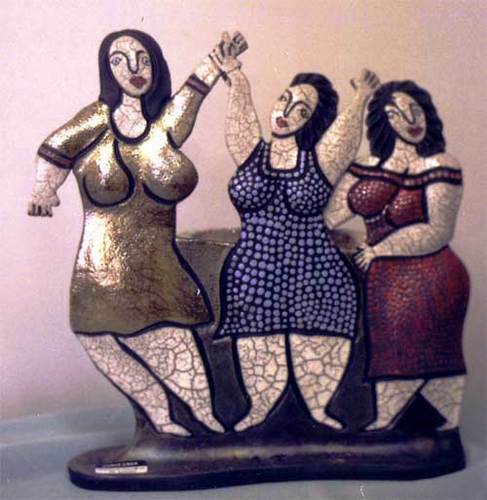 Before coming to Kelowna, Bonnie worked as a ceramic art instructor for the City of Calgary from 1986-1990. In 1990, the lure of the Okanagan brought Bonnie to Kelowna with a dream and a goal of establishing a Ceramic Arts Centre. Since then Bonnie has been teaching pottery to children, youths, adults, and seniors at Potters Addict. In 2017 Anetta Sidorowicz from Kelowna became a full partner at Potters Addict and now both potters are enjoying the fruits of their love of clay. Bonnieâ��s love of clay is most vividly shown in her hand-built clay creations which are finished in the ancient method of Raku. All of Bonnieâ��s clay works, sculpture and paintings are manufactured and sold in her studio/gallery at Potters Addict. Anetta Sidorowicz, Potter Extraordinaire! And partner with Bonnie Anderson at Potters Addict Ceramic Art Centre. Anetta Sidorowicz. As a highly motivated and result orientated ceramic artist, I have a proven track record of teaching clay as an art form, which includes glazing and decorative techniques and the ancient method of sculpture and coil design. In my recent work, the primary importance is to find the vocabulary of visual expression and to catch the liveliness and sense of motion in clay. By using classical wheel thrown forms I alter the clay by cutting through the walls then reattaching the pieces together, these are the key elements which help me to create an imbalance of the classical form causing a surface change between the front and the back of the work. I am a graduate student from the Alberta College of Art In Calgary with a degree in ceramics and design. 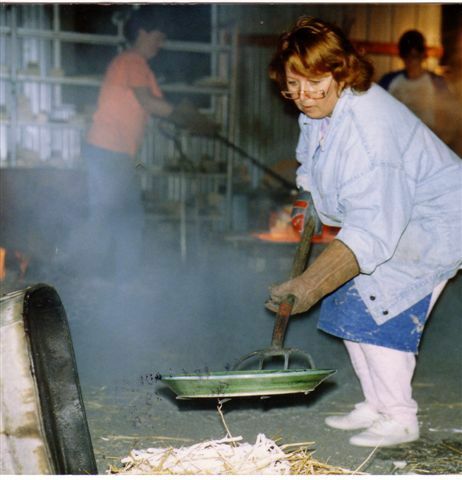 As an artist, Bonnie has a thorough knowledge of Raku and smoke firing techniques. Paint media, such as watercolour, oil, gouache and acrylic painting techniques along with woodblock, intaglio, silkscreen, lithography, and photography all showcase Bonnieâ��s amazing talents. Bonnieâ��s clay works and paintings are collected all over the world. I try to stay away form the â��Traditional Stylesâ�� of ceramics, and enjoy creating funky Raku products. Picasso and Matisse have been a great source of inspiration for me and are reflected in much of my clay work. Women are the main themes of most of my work and women with a good sense of humor are those who appreciate and purchase it. 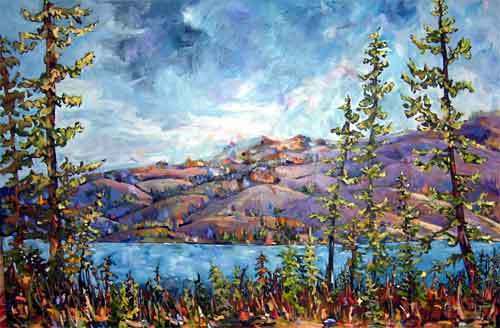 When I moved to the Rotary Centre for the Arts in 2002 I began to have an incredible yearning to pick up a paint brush and paint again. What else could I expect being surrounded by all kinds of painter personalities and their varied mediums? I am currently working on a series of landscapes using negative painting techniques on black canvas. (This is my black or dark period) But I must add this is one of the more enjoyable periods of my life and is not actually dark or black at all. I am also using negative glazing techniques on my latest line of porcelain ware which has motivated me to continue throwing again. Itâ��s great having more than one medium to occupy the mind and body for when one is at a low period in one medium another medium can be inspiring and uplifting. Going back and fourth can be a challenge but most of the time itâ��s just plain fun. I just wish there were more hours in the day for me to play. Kelowna Visual and Performing Art Centre Society. The Kelowna Watercolour Guild, past member. closed Sunday and some Saturdays.